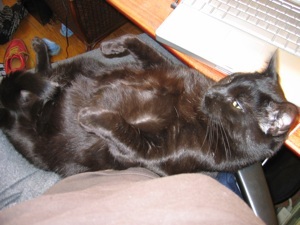 Stacy Horn » Blog Archive » A Cat Belly and ME on TV! A Cat Belly and ME on TV! I was talking to Chris yesterday about the perfection of our pet’s bellys. There is nothing more vulnerable and sweet and endearing than a cat (dog, etc.) belly. Here is Finn’s. In other news, I’ve got a birthday coming up and I find a video of me on the Charlie Rose show from 1994. 13 YEARS AGO. If you’re curious about what I looked and sounded like when I was still a sweet young thing, go here. Christ. I was still in my 30’s. This was just before Mosaic, which became Netscape, which became everything we have now, when Gore was calling the internet the Information Superhighway. God I loved and still love that man. Please give it another go Al Gore. PLEASE run again. I agree whole heartedly with your sentiments about cats bellies. Looks like Finn has a fine one. Thank you! And yeah, nothing more precious than your pet’s belly.